The story of our school is the story of a heart-held vision for our children and the growth of a community. It is Dr. Maria Montessori’s story. It is our founding staff’s story and our founding parents’ story. It is also your story. 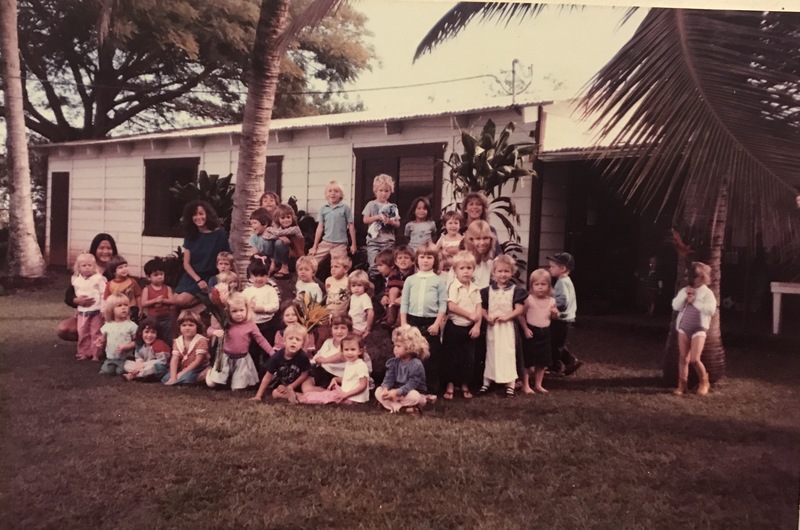 In 1978, the Montessori Children’s Home was established to offer the unique educational method of Dr. Maria Montessori to the children of Maui. There were eight students; age’s three to six, when the school opened in a Quonset hut beside St. Rita’s Church in Haiku. The first Board of Directors was formed in 1983 and Montessori of Maui, Inc. was born as a nonprofit school. During the early 1980’s, the board worked tirelessly to lay a foundation for the future of the school and everyone involved learned in the process of this grassroots effort. By 1985, parent demand led to the opening of an elementary program that quickly grew from its initial 15 members. In 1991, with a burgeoning waitlist, a third primary classroom was opened in a house in Makawao. Faced with renting three separate facilities, the board began looking for a permanent campus for the Montessori School of Maui. In June 1991, the School signed a contract with Maui Land and Pineapple Company to lease, with an option to buy, four and a half acres on Baldwin Avenue in Makawao. Construction began in early 1994 and was completed in the fall of the same year, enabling the school to move all of its classes to the new campus and bring the entire program together for the first time. Later that year, the Toddler Program was added. Through the years, staff, parents and other volunteers and friends from the community have successfully worked together to develop the school’s permanent campus facility. A second phase of construction, to add four additional classrooms, was completed in December 1996. In August of 2001, responding to requests from within the community, the School grew once again by expanding to include a Middle School. In January 2002, the School purchased the four and a half acres our school resides on as well as the additional four and a half acres above the property, ensuring a permanent home for the School. In April 2004, a beautiful donor arbor was unveiled as a tribute to the families, foundations, corporations and friends who contributed to the establishment of our lovely campus. The 2004-05 school year marked the beginning of a new capital campaign to build additional classrooms and facilities. These buildings were completed and occupied in 2008 and this campus expansion was awarded LEED® Silver certification established by the U.S. Green Building Council. LEED is the nation’s preeminent program for the design, construction and operation of high performance green buildings. Through this and future projects, we are creating a model campus in terms of sustainable design, materials and practices. In 2012, the School unveiled a new basketball court on the upper portion of the property, providing an exciting new resource for the school and Upcountry community. Our elementary students have had a thriving basketball team every year since the courts were built. Further enhancements to the school campus were made during 2015, when our Administrative Offices were redesigned, centralized and moved to an existing renovated building. Additionally, we expanded upon our former office space building to build a large dual-room Middle School Classroom Environment to support our growing needs for our 7th and 8th grade students, which includes, a large classroom space, lanai and multipurpose space used for science lab work and kitchen use. Finally, our School Library was moved adjacent to the Toddler Classroom and our Art Room was relocated to our RFC building, where we added an outdoor Ceramics Area for our ceramics wheels and art class use. Since 1978, the school has achieved steady growth as it has worked to meet Maui’s educational needs for young children and adolescents. Dedicated board members, volunteers and staff have consistently worked to accomplish our ambitious goals. The leadership of the school continues to be derived from a combination of parents, staff and volunteers. Many former board members remain in service of the school through an advisory capacity. This blending of past and current members has helped guide the school’s evolution and strengthen the very foundation of the organization. The Montessori School of Maui has a commitment to creating a positive relationship with the natural world and our community, and to offering students a personal experience that connects academics with these vital aspects of life. We are proud to provide a true model of exceptional education. The Montessori School of Maui is a non-denominational, non-profit 501I3 corporation licensed by the Hawaii Council of Private Schools and the State of Hawaii Department of Human Services. The school is fully accredited by the Schools Commission Western Association of Schools and Colleges (WASC) and the Hawaii Association of Independent School (HAIS).